Momas and Dadas, cordially invites you to throw some money around the Las Vegas Arts District with curator, Jevijoe Vitug. 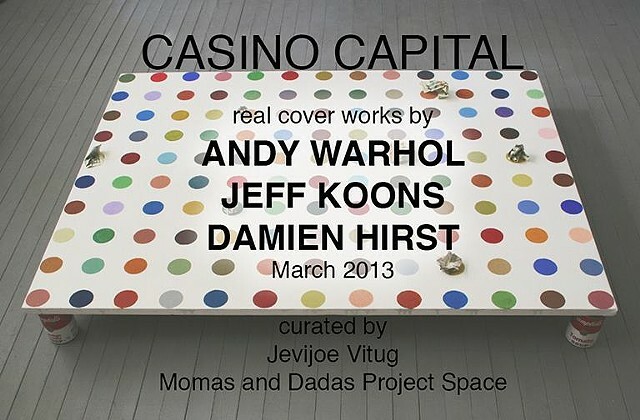 Featuring real cover sculpture by Andy Warhol and Jeff Koons, in addition to an original cover painting by Damien Hirst. Please join us for this “one night only” event of high risk, speculation, and hoping for the big win, as all guests will have the opportunity to take home one of these prize possessions. 926b South Casino Center Blvd. Located downtown right across from the neon 18b Arts District sign. *This exhibition is made possible by the generous donations of an anonymous San Francisco philanthropist.